Abigail Perl stands out amongst this year’s nominees for her ability to turn a negative personal experience into something positive. After struggling with intense bullying as a teenager, Abigail left high school in hopes of finding solace and was inspired to launch an anti-bullying initiative. To spread awareness of what bullying really looks like, she authored a comic book featuring a non-binary person of color who struggles with mental health issues and bullying. Both Lady Gaga and Fall Out Boy have recognized Abigail’s work as groundbreaking, and we know you will too after reading her story. What inspired you to create your nonprofit organization, Diverse Gaming Coalition? Diverse Gaming Coalition was created in November of 2016 after my bullying experiences in high school. During high school, I was always the odd kid out. I was called names, treated poorly, and felt as though I didn’t belong. I knew others in my school felt the same way, including my own twin brother who was constantly harassed for being gay, but nothing was ever done about it. Adults would overlook the issue and act as if it wasn’t happening. Even if they did know about the bullying going on, it was always something that wasn’t easily understood. Every time a speaker or influencer would come in and present an anti-bullying assembly or presentation, they wouldn’t truly grasp the concept of bullying today. I was fed up with all of this and wanted to change everything on my own terms. During my junior year of high school in 2015, I dropped out and received my GED. I took this leap of faith as an opportunity to change the status quo. I wanted others to know they weren’t alone in their journey and that someone understands what they’re going through. After all, who is better equipped to discuss the bullying that occurs today than a young person? How do you hope to expand and grow the Diverse Gaming Coalition, and where do you see yourself growing within it? Since starting Diverse Gaming Coalition in 2016, we’ve progressed immensely. From our anti-bullying comic book campaign, to our partnerships, to our programs connecting with gamers around the world, we’ve seen outstanding growth. In the upcoming years, we hope to see Diverse Gaming Coalition grow into a national organization. Although we’ve impacted various communities across many states, we’ve made our mark primarily in the northeastern United States, where we operate. We feel that our message deserves to be shared across America. Currently, I attend Southern New Hampshire University for Business Administration with a concentration in Nonprofit Management. My love for helping others has led me to choose a career path that aligns with my organization. I plan to continue my work in the organization as not just a volunteer, but something I can do to support myself and my family. Having a successful career is something I greatly admire, especially as an entrepreneur. My family is full of entrepreneurs, and seeing their success while doing what they love has inspired me to do the same. Being able to turn my volunteerism into a full-time job is a personal goal of mine. Growing up, I was obsessed with video games. Gaming has allowed me to create strong bonds with friends and family and helped me to find solace during dark times in my life. Whenever I felt scared, angry or upset, video games were always something I turned to for comfort. Even today, video games play an important role in my life, although I may not have the same amount of time to play like I used to. Lots of people find the same comfort in the things they love. I wanted to reflect this in my organization, and specifically our comic book. Young people engage more with things that fall within their own interests and, most importantly, with stories that are relatable. I always had an interest in comic books and superheroes. It wasn’t until a mentor suggested that I utilize a comic book to discuss bullying that I actually considered the idea. After strategically working out the kinks, “Life On The Outside” was created. How do you balance being a college student with being executive director of your own non-profit organization? Balancing my life as a part-time postal worker, full-time student and volunteer executive director can be very difficult sometimes, but it is doable. Utilizing a daily planner has helped with simple things such as meal-planning and budgeting, as well as more in-depth tasks such as planning my day. Im currently a junior and have been able to balance my life fairly well, but at the start of my college career that wasn’t the case. It takes a lot of trial and error to find what’s right for you. Personally, I’m lucky enough to have a job that I can schedule my school and nonprofit work around. In reality, it’s not for everyone. It takes a lot of discipline to be able to do what I do and is something that is learned over time. Especially since my school is all online, I have to have discipline because it’s all on me. Some days, a work-life balance is almost non-existent. But, having such rewarding outcomes is what keeps me so persistent in my work. What advice do you have for other college women who have struggled or are struggling with bullying and harassment? My advice to college woman who have struggled or are still struggling with bullying and harassment is to never beat yourself up over it. Many times, when these perpetrators use malicious means to target a victim, they tend to do so over their own insecurities. Never feel discouraged or defeated. Time is the ultimate teller for situations of bullying and harassment. Bullying may occur while in college, but doesn’t continue on with you past graduation. Simply put, my advice would be to take everything one day at a time. Find solace in extra-curricular activities such as sports or clubs, engage with new people, or embark on a new journey. Life can seem rough, but I always find peace knowing that things will completely change five years down the line. Nothing stays the same, keep striving towards your goals, chase your dreams, and follow your passions. Soon, it will all be worth the hard work. My greatest achievement thus far would have to be starting my own non-profit organization at the age of seventeen. For me, it’s always been a dream of mine to help others. Ever since I was little, I was always an advocate for something, including being a Girl Scout for almost ten years. By constantly working towards the greater good, it simply became natural to me. In high school, I had a difficult time deciding on a career path that was right for me. It took me almost my entire school career to realize that I can make a career out of doing what I love, and what I love doing is helping others. So, I embarked on my journey to create my own non-profit. For countless hours, I took courses and researched other non-profits. I created my entire vision for my non-profit, including our mission statement, our goals, etc. I built our website and reached out to others in the field for their support, and it worked. I’ve been proud of the success that has followed since then, but taking the leap of faith to start something from the ground up is the first step to success. I haven’t always had ambition and drive, but I gained both while building something as big as Diverse Gaming Coalition. 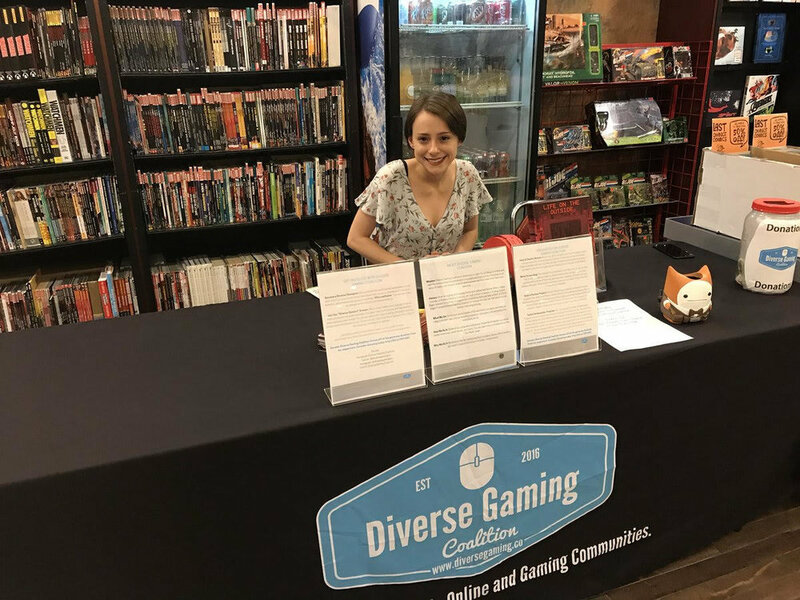 Post-graduation, I intend to continue in the nonprofit world as a full-time Executive Director of Diverse Gaming Coalition. I anticipate using my newfound knowledge within my degree field to turn Diverse Gaming Coalition into a national organization. After graduation, I will be able to allocate my time to expand, improve, and innovate my organization.